Today is the start of sneak peek of new releases from Taylored Expressions. And it is also Taylored Expressions 8th Birthday! Its a wonderful milestone for Taylored Expressions. I wish Taylor and TE Happy Birthday and many more years of success! 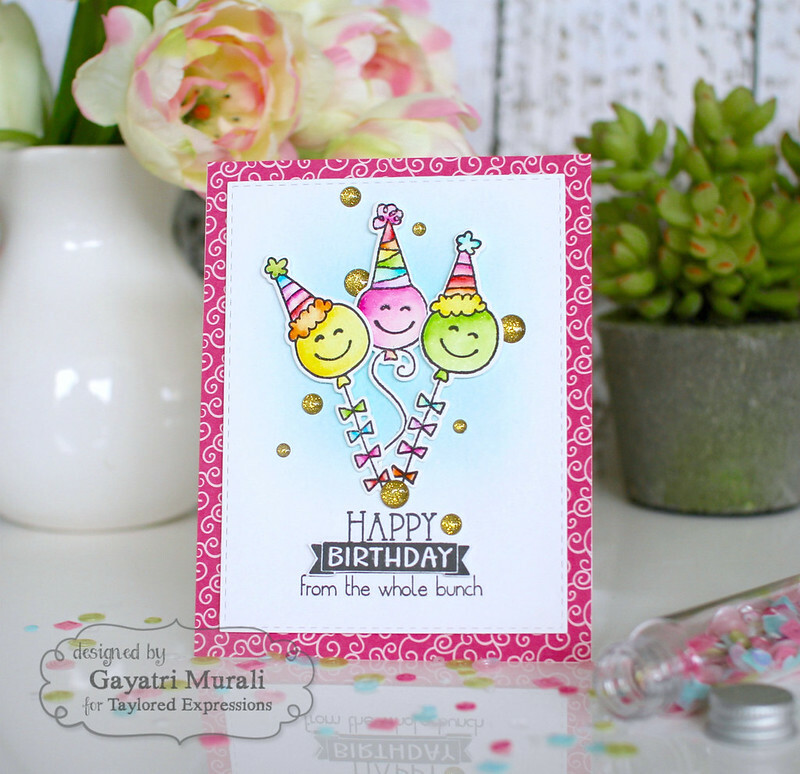 Today’s sneak peeks feature two new birthday stamp sets and dies. The first stamp set to sneak peek today is called Bold Balloons. This stamp set also have matching dies. I love balloons! Everybody loves balloons. 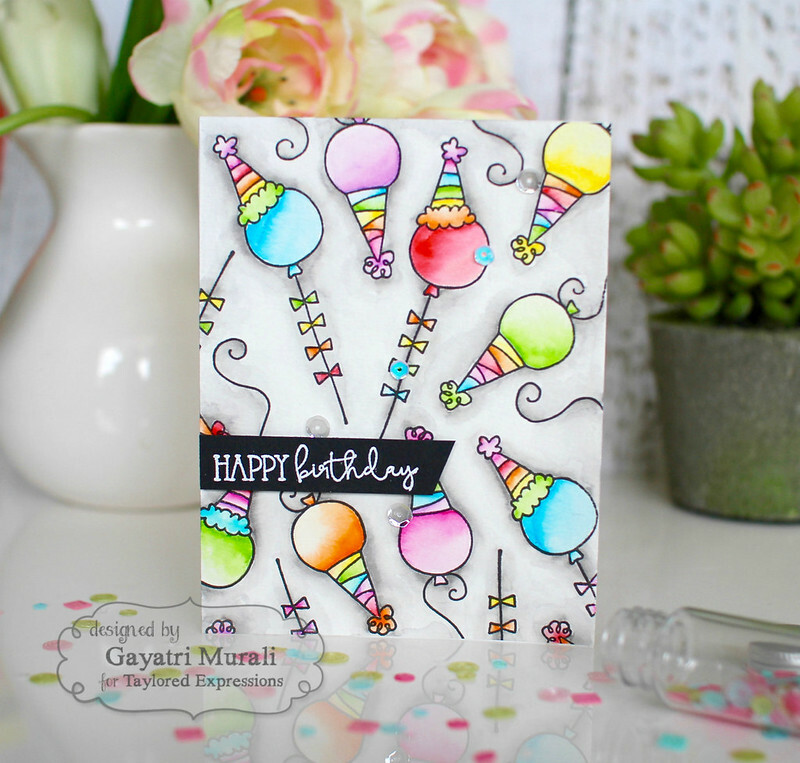 This set has four different shapes of balloons and three sentiment threads. Very cool. Here is my card using the stamp set and dies. I have simply stamped the big oval balloons from the stamp set using Pink Champagne, Cookie Monster, Saltwater Taffy, Lollipop and Mint Julep dye inks from TE. Then used the coordinating dies to die cut them out. I cluster glued them adding black twine behind them. 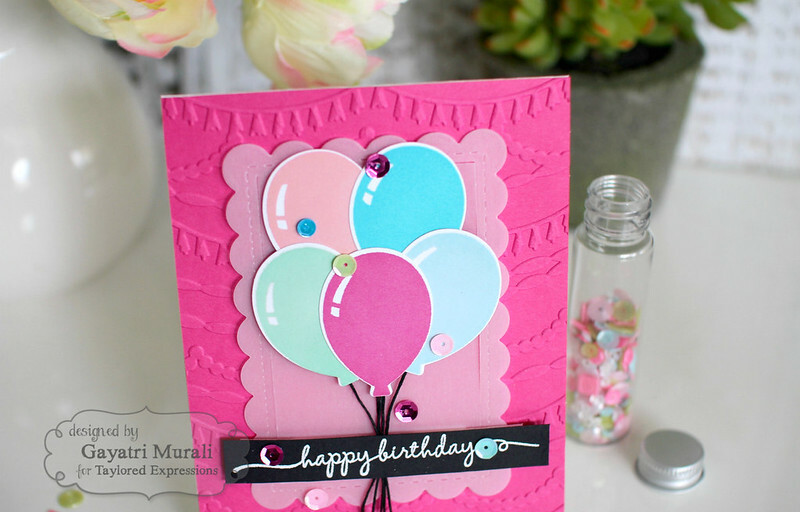 For the background of the card, I have embossed TE Lollipop cardstock with new Streamers embossing folder. LOVE the variety of streamers. 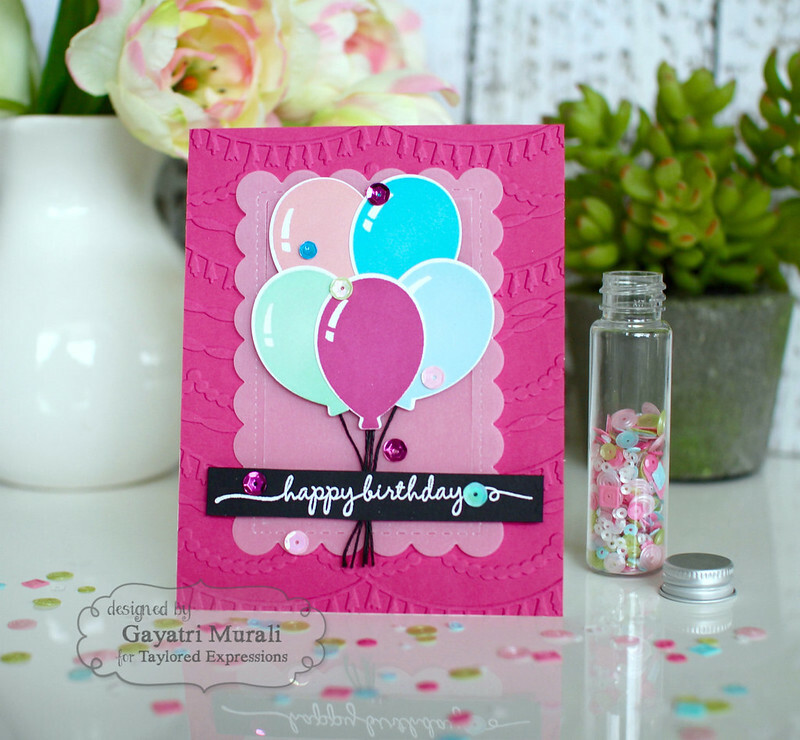 I layered the balloon cluster on a vellum scalloped layer die cut using a die from Frame in Frame die set. The sentiment is white heat embossed on Oreo cardstock, trimmed and adhered on the card front. I embellished with sequins from various TE sequins collections. 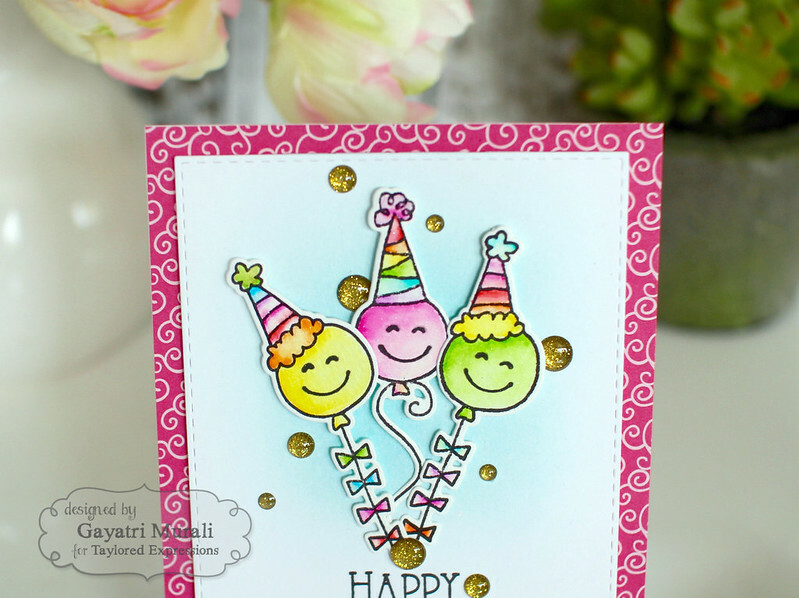 The second stamp set I am sneak peeking today is If Balloon could Talk stamp set and die combo. This is a cute stamp set in the sense that you can add faces to the balloons and make it your own. How cute? I have couple cards to share using this stamp set. On the first one I have used the happy face on the balloons and clustered them. I have stamped, watercoloured and die cut the balloons from the stamp set. I die cut a white cardstock using the largest of the Stitched Rectangle Stacklets. I sponged Salt Water Taffy dye ink on the centre of the white stitched panel.Then adhered the balloon die cuts on top. I stamped the sentiment below the cluster. I also stamped the sentiment on a scrap piece of paper, cut out the banner birthday from the sentiment and foam adhered on the sentiment on the panel. One the card front I adhered the pink pattern paper from Hello Happiness 6×6 pattern paper pack and foam mounted the white panel on top of it. Finally embellished with gold sparkly enamel dots from Doodlebug. I also brushed clear shimmer on the hats of the balloons. 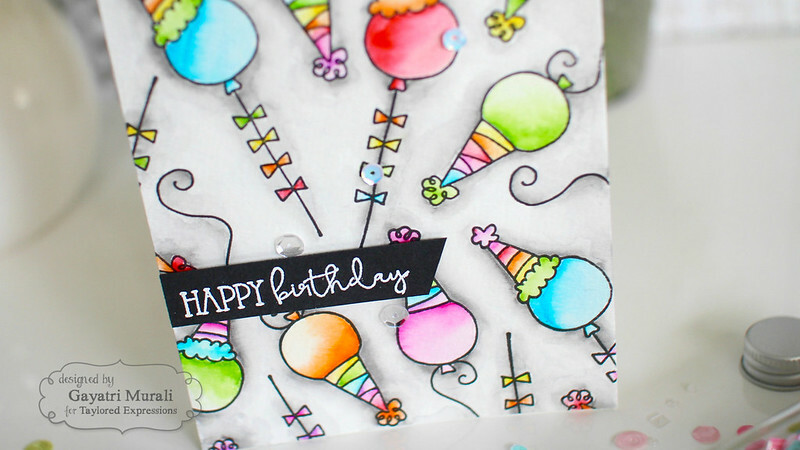 On my next card, I simply stamped the balloons on watercolor paper and water coloured the balloons using Zig Clean Brush markers. I let the watercoloured balloons background be the highlight of the card. So I simply white heat embossed the sentiment on Oreo cardstock strip and adhered on the card front using foam adhesive. Then used the clear sequins from Build a Scene Halloween collection to embellish. Hope you like my projects. Taylored Expressions is celebrating its 8th birthday with some fun party favors! These include everything from the exclusive WISH BIG stamp & die combo set to patterned paper packs, ink, and more! Visit the TE Blog for all the special offers and for your chance to win a fun prize! Check Taylored Expressions Blog for more details on today’s sneak peek products and design team inspirations. Thanks for stopping by my blog today. Check in tomorrow about more. Your cards today are just adorable! I really love that first one!!! I have been wanting some fun balloon sets and you cards makes me want these all. Fun cards! I love all three of your cards. I have enjoyed looking at your work since finding you through other blogs. Very clean and colorful – like Taylor. Your cards are fantastic. Love the one from the bunch. Love how you created a background with the balloons. Very creative! Happy Birthday to TE. Cute colorful cards, love them all! Love all of your happy balloon cards. So fun.